Are you wondering what type of sports pant will work better during your workout? When you can only pick one sports garment - choose leggings. They’re definitely more universal - when it comes to the time of the year, type of sport and the situation in general. If your workout requires a lot of precision and you can’t allow yourself to be distracted by anything - decide against pants with any kind of straps. In that case, simple leggings or regular shorts will work best. Sports shorts, however, are irreplaceable in hot weather - paired with a top they are a sure-fire combination for a summer jog or dynamic yoga practice. What kind of leggings are best for you? Sports clothing are the perfect opportunity for a bit of madness! If you have to dress up every day because of your dress code at work you’ll know how good it feels to slip into comfortable leggings at the end of the day! There are hypnotizing ethnic patterns or more subtle ethnic tattoo- and mandala-inspired models to choose from. A lot also depends on colour. For women who prefer toned-down versions, we have classic black & white combinations. For those who love bold, intense colour combinations we have models with more saturated shades. You like classic black the most? You can either choose timeless black leggings or models with laser cutouts. How to care for leggings? We know you can’t complain about a lack of responsibilities and that’s why you expect your sports clothes to be easy to maintain - that’s completely understandable. All our leggings can be machine washed (with a recommended temperature not exceeding 40 degrees) and don’t need to be ironed. 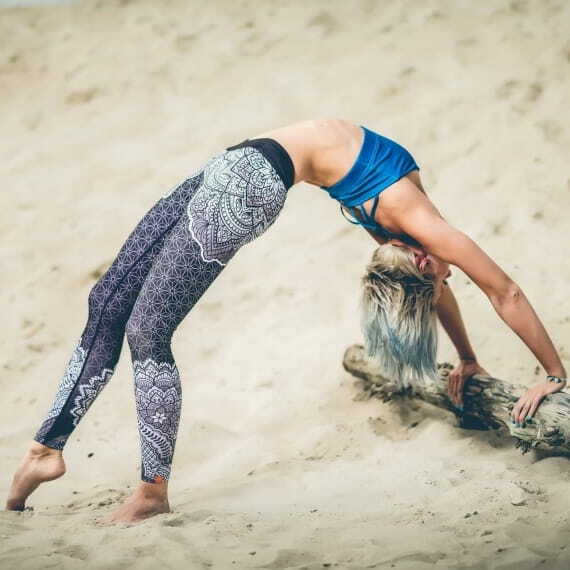 The leggings are made out of quick-drying fabric so you can already put them on an hour later for your next session! Thanks to the advanced technology used for the prints your tights won’t lose their intense colour even when used regularly.